Danny Holt (Wilson) is a good, hard-working guy with a tough job. He’s a repo man, constantly having to deal with irate car buyers who’ve lapsed on their payments. One day he repo’s the car of evil gangsters Weiss (Browne) and Scarface (Daniels). These dudes are so miffed about it, they go down to Danny’s place of employment and mow down the entire staff with their machine guns. Naturally, Danny was out getting lunch, and missed it all, so the cops think he did it. Seeing as how these gangsters are hiding some nuclear triggers inside a box of bunny-shaped Easter chocolate and Danny has it, he’s now on the run from the gangsters, the cops, the FBI, the CIA, and everyone in between. Weiss has also kidnapped his daughter and won’t release her until he gets the “box of chocolates”. With no one to trust, can Danny use the help of Shannon (Wyss), a schoolteacher accidentally thrown into this mess? Will Danny get to the truth? Perhaps as a reaction to the somber tone of the previous Bloodfist movie, this one has a much lighter, and at times even goofy feel. Just check out the opening scene between The Dragon and a man who looks like he could be the father of Wendy of fast-food chain Wendy’s fame. But the overall tone goes back and forth between silly and serious with relative ease. James Tolkan appears as FBI agent Sterling, and it’s nice to see him, but what fans really want to see are the fights between Wilson and Gary Daniels. We’re treated to two of them, and that alone makes this movie worth checking out. Daniels plays a very amusing villain, with his long hair and snide attitude. But we think his strong suit is playing heroes. He’s just too likable to seem all that evil, though he does very well here. Also female baddie Lisa (Sassoon) adds further appeal because of her outfits and cult appreciation. Apparently, this movie was remade, again with Wilson, as Moving Target (2000). I guess Don the Dragon had been in every type of movie ever made so the only option left was to redo THIS movie. Seems odd. Of all the movies to potentially remake...Bloodfist 4: Die Trying? Bloodfist 4 is a great choice for Don the Dragon fans. If you don’t consider yourself one, don’t “die trying” to pick this one up, but if you see it somewhere, get it. Great review. 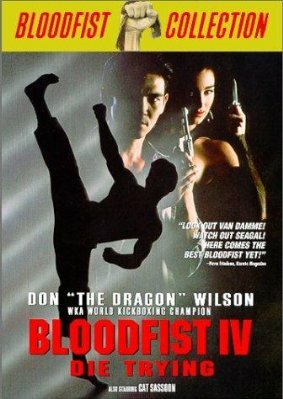 I'm sure I've seen 1 Bloodfist film but it wasn't this one. Thanks, Ricky! I wonder which one you watched? Sadly I have fond memories watching Bloodfist I with my college buddy. Dr. Blacksteed: Haha, it is a pretty ridiculous plot! Would be interested in your opinion. Copyboy: Hmm, why was it sad? Bloodfist 1 is one of the best Bloodfists! This was one of those cases where the flick starts off just fine but then it runs out of steam about the halfway point and never recovers. I really wish Daniels' role was beefed up more and that his and Dragon's fight had been saved for the climax. The Daniels Mullet was impeccable however. Totally agree with you! Daniels should have been in it more. His mullet was awesome! I'm guessing that there were many unanswered questions from "Bloodfist" III, II, and I that needed to be answered. You know I don't think I've ever watched a Don Wilson movie in its entirety. Haha, they unfortunately didn't answer any questions from the sequels! Which ones did you try to watch? I agree with you. The U.S. Seals movies were a lot of fun! We are going to watch U.S. Seals II soon for the site. Ty I think the one I tried to get through was called Futurekicks or something like that. Haha, oh yeah, Futurekick. That was pretty bad. I can see why you couldn't get through it! I enjoyed this one too. Nothing spectacular, but enough action-- and a great fight between Daniels and Wilson-- to get me to the church on time. Definitely agree. The Wilson-Daniels fight was a lot of fun. Daniel's mullet was hilarious too!